Relaxing in a hammock by the ocean is always tempting, but the Grenadines has so much more to offer. Those who love watersports are in luck, as there’s plenty of chances for swimming, snorkeling and sailing. Some of the Caribbean’s best diving spots can be found at the Tobago Cays national park. Here, you can swim with sea turtles, parrotfish and all kinds of colourful tropical sea creatures. 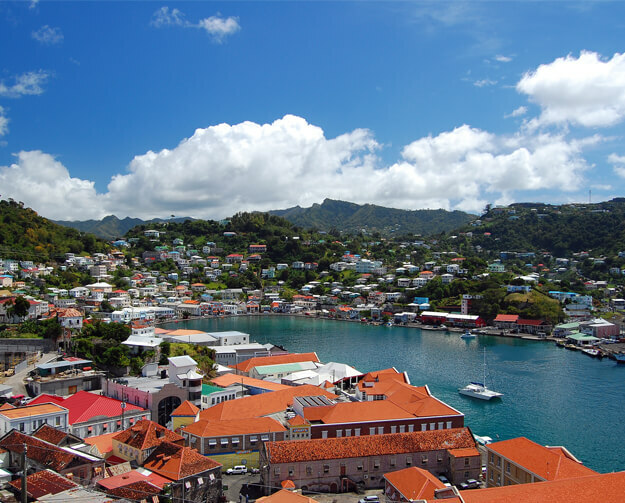 The Grenadines is also known for its yacht harbours, and sailing and boat trips are always on the agenda. If you fancy a change of scenery, regular ferries transport passengers to and from the many islands. Meanwhile, if you enjoy hiking, there are volcanoes to climb, rainforests to explore and waterfalls to dive into to. Grenadine is famed for its many island beaches. 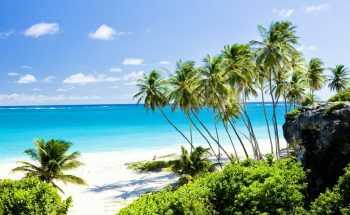 Princess Margaret Beach is one of the loveliest stretches of sand, flanked by dazzling turquoise waters and lush vegetation. The warm and calm waters of Princess Margaret Bay also make it ideal for swimming. Another popular spot is Big Sand on Richmond Bay, with its soft white sand and forest-covered mountains. Some parts of the Grenadines have no Wi-Fi, telephones or even TV - perfect for holidaymakers who want to completely disconnect from the outside world. Relaxing days can be spent getting back to nature and going for leisurely strolls along the beach. Not all luxury hotels in the Grenadines are disconnected though, so you can still enjoy home comforts during your tropical island retreat. These upmarket resorts offer a range of delicious food and rejuvenating spa and wellness centres, where you can choose from a variety of indulgent treatments. The island has a rich heritage and multi-ethnic culture, thanks to French, Portuguese and British settlers. Influences from these different countries can be seen in the island’s cuisine, architecture and music. Although the Grenadines islands are small, there are a handful of interesting, historical buildings to explore. The imposing Fort Charlotte stands, which stands on top of a 660ft-high ridge, is well worth a visit. The fort was built as a military post in 1806 and still has a few of the original cannons. Music is a large part of island culture, particularly Caribbean gospel, calypso, and steel band music, and it’s always worth trying to catch a live performance when visiting. Most of the ingredients you’ll eat in the hotels and restaurants will have been produced locally. Fish meals are often made from the morning catch, which is sold to the chef just hours before it’s cooked. Be sure to taste the national dish of fried jackfish and roasted breadfruit, and wash it down with the Grenadines favourite drinks of Hairoun beer and Sunset rum. If you’re looking for an idyllic island escape, look no further than the Grenadines. 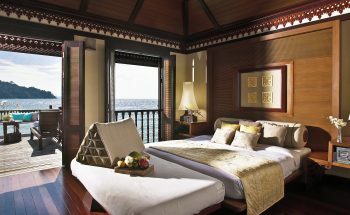 At Azure, our holiday packages offer a back-to-nature experience with a high level of comfort. Contact us today to find out more. 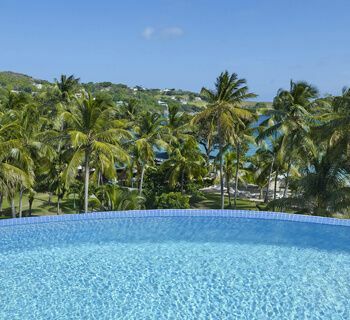 Brand new to Bequia, the Liming resort offers exclusive accommodation with a chilled-out vibe. 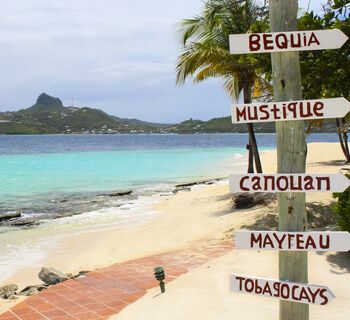 The Isle of Bequia forms part of St Vincent and the Grenadines and means ‘island of the clouds’. With its fine white sand and pristine clear waters, it is not hard to see why this place is considered to be paradise. 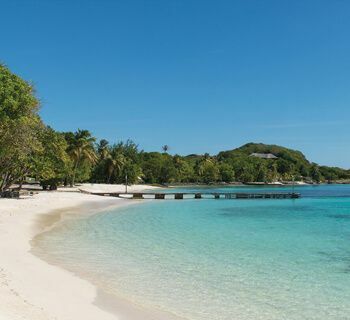 Located on a beautiful strip of sand surrounded by lush gardens, Bequia Beach Hotel is styled upon the Mustique villas created by Oliver Messel. If you’re looking for elegant and affordable accommodation in the Caribbean, this gorgeous boutique hotel on the island of Bequia is for you. 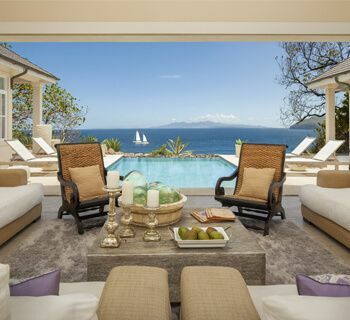 In a secluded spot among the picturesque Grenadines lies the elegant Cotton House. It’s the perfect getaway for those seeking a relaxing holiday in stunning surroundings. 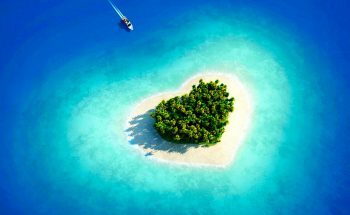 There are 32 islands that make up the Grenadines. 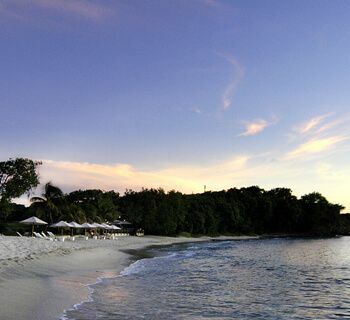 Mustique is a tiny, privately-owned island and Cotton House is its only fully-serviced, upmarket resort. The location may be quiet and peaceful, but there’s no shortage of luxury service and modern amenities for people who appreciate the finer things in life. Palm Island Resort & Spa has everything you would expect from a luxury resort, with sumptuous seafront accommodation, first-class amenities and a range of exciting activities, from watersports, to shopping, to island excursions. 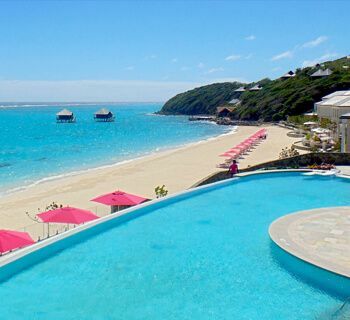 Pink Sands Canouan Island offers an idyllic setting of crystal clear waters, sugary white beaches and lush vegetation.